“Not one of us would say that we are on a course to success in Afghanistan,” U.S. senator John McCain, an Arizona Republican, told a room full of journalists, U.S. soldiers and diplomatic staff in Kabul on July 4, 2017. McCain was accompanied by Senators Lindsey Graham, Sheldon Whitehouse, Elizabeth Warren and David Perdue. 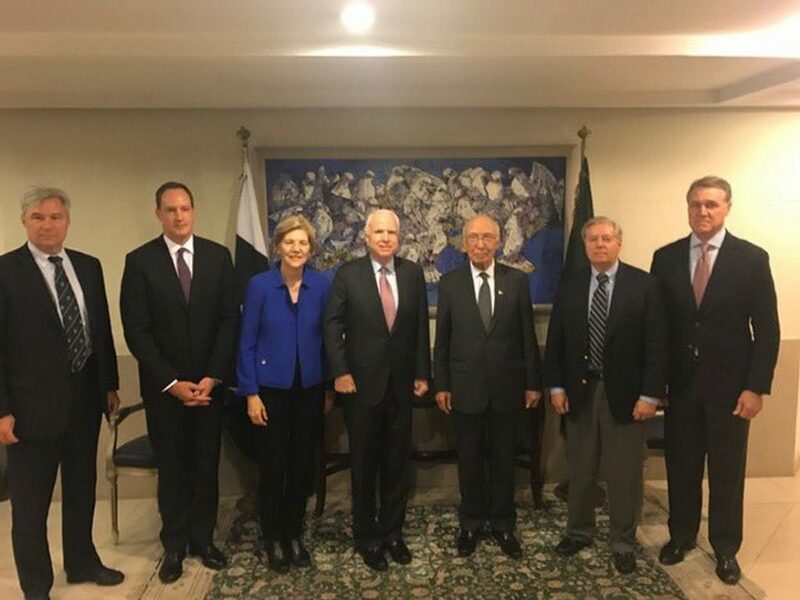 Together they visited Pakistan, Afghanistan and the United Arab Emirates to assess America’s longest-ever war. Their conclusions were not optimistic. With the Taliban, Islamic State, the Haqqani network and other insurgents fast gaining ground, the delegation was unanimous on the need to bolster American forces. Pres. Donald Trump appears likely boost the 8,600-strong U.S. contingent in Afghanistan by as many as 5,000 additional troops in coming months. “The one thing I will tell [Trump] about this visit is that you need to pull all of our troops out — because 8,600 will not get the job done — or add to their numbers,” Graham said, adding that he would also suggest a significant increase in U.S. air power in Afghanistan. The senatorial delegation did not, however, agree on the long-term U.S. approach to the Afghanistan war. “It will probably be a low burning, simmering crisis for many years to come,” McCain said. A Vietnam War veteran and ex-prisoner of war, a visibly frustrated McCain came out strongly against former president Barack Obama for even suggesting a deadline for pulling U.S. troops out of Afghanistan. Warren, a strong critic of Trump and his administration, insisted that Americans’ patience for the war would depend on U.S. strategy in the region. “We need a strategy in the U.S. that defines our role in Afghanistan, defines our objective and explains how we are going to get from here to there,” Warren said. The Trump administration has failed to fill the diplomatic vacuum it created when it shut down the Office of the Special Representative for Afghanistan and Pakistan in early 2017. Likewise, Trump has failed to appoint new U.S. ambassadors to Afghanistan and Pakistan. The senators described what winning should look like in Afghanistan. McCain described it as a scenario where government could secure most parts of Afghanistan and call a permanent ceasefire with the Taliban.